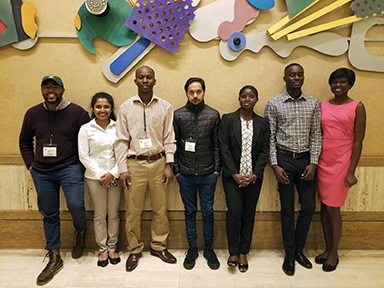 Seven Montana Tech students attended the National Society of Black Engineers (NSBE) Fall Regional Conference in Las Vegas, Nevada, from November 8-11, 2018. The students presented two posters, two talks, and competed in the “Elevator Speech Competition.” NSBE conferences provide inspiration, education and connections needed for students to succeed as engineers. The theme for this conference was “Explore. Engineer. Elevate.” Students were able to attend workshops, a career fair, community service, networking, competitions, and resume building exercises to develop professional and technical skills. The student from Montana Tech who attended were: Augustina Osabutey, Environmental Engineering graduate student; Harold Pearson-Nadal, Mining Engineering; Sowmya Sudhakar, Mechanical Engineering; Abdul-Sommed Hadi, Materials Science doctoral student; Suvash Ghimire, Materials Science doctoral student; Francis Inkom, Mining Engineering graduate student; and Irene Ateng, Mining Engineering graduate students.